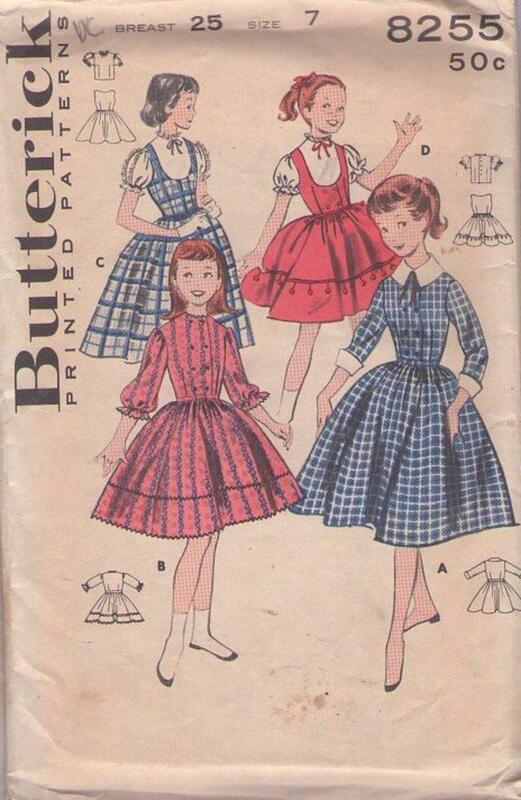 Bust 25", Waist 22.5", Hips 27"
1957, 50s Children, Retro Modest Clothing Patterns - GIRLS' DRESS, JUMPER AND BLOUSE. Double breasted dress or jumper. Bow-tied short-sleeved blouse. (A) Dress with contrasting puritan collar and cuffs. (B) Full sleeve dress with provincial rick-rack trim. (C) Jumper with lace-trimmed Tyrolean blouse. (D) Ball-fringed jumper with plain blouse.